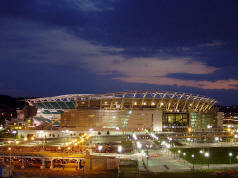 Get the best prices on Cincinnati Bengals hotels from WorldsBestDeals.com. This is your source for hotels near the Cincinnati Bengals football Paul Brown stadium as well as car rentals, flights, local weather and guaranteed low hotel rates. For more Cincinnati, Ohio hotel options click here, or use the form below for the next Bengals football game. Paul Brown Stadium is right by the river between Cincinnati, OH and Covington, KY.
From I-75N/I-71N – Take I-75/I-71 north to the 2nd or 5th Street exit in Ohio; follow traffic police to desired parking lot. From I-75 South – Take I-75 south to the Freeman Avenue exit and go south on Freeman Avenue; turn left on Mehring Way and follow directional signs and traffic police to desired parking lot. From I-71 South – Take I-71 south to the Gilbert Avenue/Riverfront Parking exit or 3rd street/Downtown Parking exit and follow directional signs and traffic police to desired parking lot. From I-471 – Take I-471 north to west US 50/I-75; take the 3rd Street exit and go west on 3rd Street; follow the traffic police to the desired parking lot.